Hello, readers, and welcome to Teen Fiction Girl! Christmas is getting even closer, and quite honestly, I can’t wait. As we all know, with great holidays come great holiday specials on our favorite MMOs, so read on for a bit more on that. In this post, I’m going to be talking about the three MMOs I play. If you read the title, you know what they are. Only one of them does not pertain to Christmas in some way. So, for you holiday lovers who also happen to be gamers, this ought to be fun for you. So, Yule has come back to Rift! This means a month-long game event full of new wardrobe appearances, mounts, minions, quests, and so much more. You can go sledding in Iron Pine Peak, rejuvenate the humbugs with Christmas cheer in Sanctum and Meridian, and get a new holiday currency from questing and closing rifts. This currency can be used to buy a plethora of awesome Christmas, winter, or holiday-related items in a new World Event section on the Rift store. Beware, savvy costume-seekers; some of the costumes in the store are returnable, while some consume automatically once you buy them. I planned to save up as many snowflakes (that’s the currency) as I could to buy and then return all of the wardrobe appearances – and thus not actually lose any money – but I lost three hundred of them on the fur cloak. It’s cute, so it’s worth it, but still. 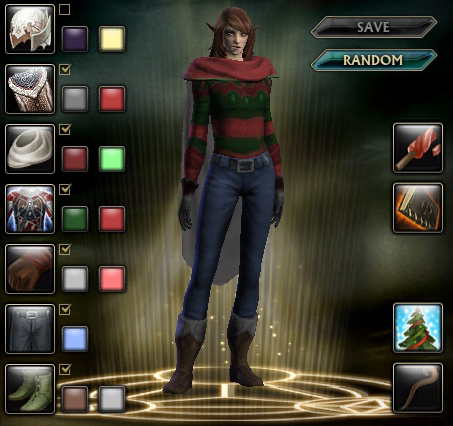 This is the outfit I put on my character for Christmas. Sorry for the blurry picture. As for Diablo 3, nothing new has happened (since it’s not as actively updated as Rift or maybe World of Warcraft is – it’s more of a set-in-stone MMO) but that may change soon. I might well be getting the Reaper of Souls expansion pack for Christmas (I asked for it, anyway) and, if I don’t, then I’ll buy it myself. So, after Christmas, expect a lot more Diablo-related posts as I explore the new act of the game. I got to level 8 on my main character on Trove. I named her _Myra because just plain Myra was taken, and I made her to look as much like my Diablo character as I could. That’s only one class; this afternoon I unlocked the Chloromancer class (it’s free if you get the quest on Rift!) and played it to level 4. My graphics card has been acting up lately, so I only got that high before it flipped out on me, but that’s easy to fix since I’ve had a replacement graphics card on hand since I got the computer (I learned that having a backup is always safe after the fiasco with my laptop last year). Yeah, I’ll leave it there. Diablo 3 is back (for me, anyway)! Hey, readers, and welcome to Teen Fiction Girl! I posted about gaming quite a bit on Tween Fiction Girl, but this will be my first gaming post on my new site, and I’d say it’s a worthy post. For those of you that don’t know (which will probably be nearly all of you), I played Diablo 3 for a few years from, like, 2012 to 2014. Then, when my old computer started conking out, my mom decided that the reason was probably video games, because mom logic. She deleted Rift and Diablo 3. Rift was easy enough to get back, since I’d downloaded it off of the internet in the first place, but my Diablo 3 case had been thrown away three years previously and I had no idea how to get it back. That is, until I had a rather obvious brainwave and decided to visit battle.net to actually try and see how to get it back instead of mourning. So, bottom line, the Blizzard gaming is back. Now that the Reaper of Souls expansion pack is old news, it’s $20 instead of $40, which means I may be buying it in the very near future. (Alternatively, I could just wait, since, you know, Christmas, but I’m impatient.) Up next in my Diablo 3 posts: my journey to Whimsyshire (aka the cow level), my praising the new gear transmogrification system, and/or several or multiple screenshots of Myra, the MMO character after which I named several other accounts. Anyway, this post is the first of many where my gaming odyssey is concerned.